Do you want to know what is one thing you are sure to find on every corner of Prague? – Trdelnik. 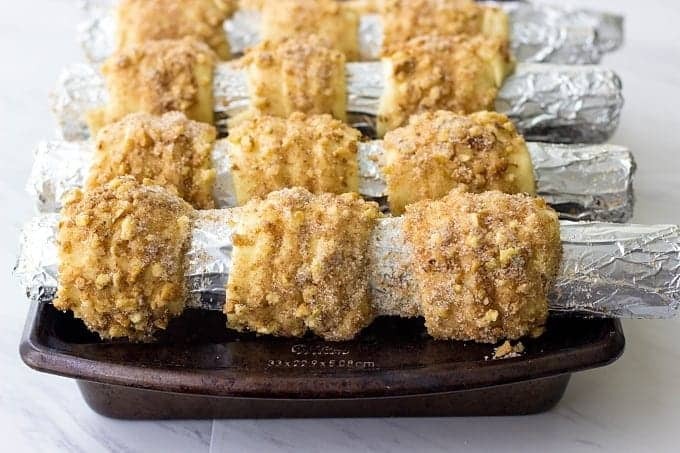 It’s a traditional Czech pastry dough, wrapped around a stick, rolled in cinnamon-walnut and sugar mixture and baked to a crispy perfection. Does it sound amazing? It sure is! Let’s get cooking! Believe it or not, this post or better to say this recipe was that close from never happening. Why? I’ll tell you in a bit. My mom was the one who suggested me making Trdelnik recipe for my blog. Since I haven’t posted any Czech recipes yet, I liked that idea and was eager to make the recipe ASAP. But, there was just one thing that kept me from doing it. In fact, it probably took me 4 months before I found a solution to a problem and made Trdelnik at home. Trdelnik has a cone shape. The dough is wrapped around a special cylinder stick called Trdlo and baked on the open fire. So where on Earth can I find that stick? Nowhere. Unfortunately, I haven’t seen it in the US stores. I’ve found one option online. 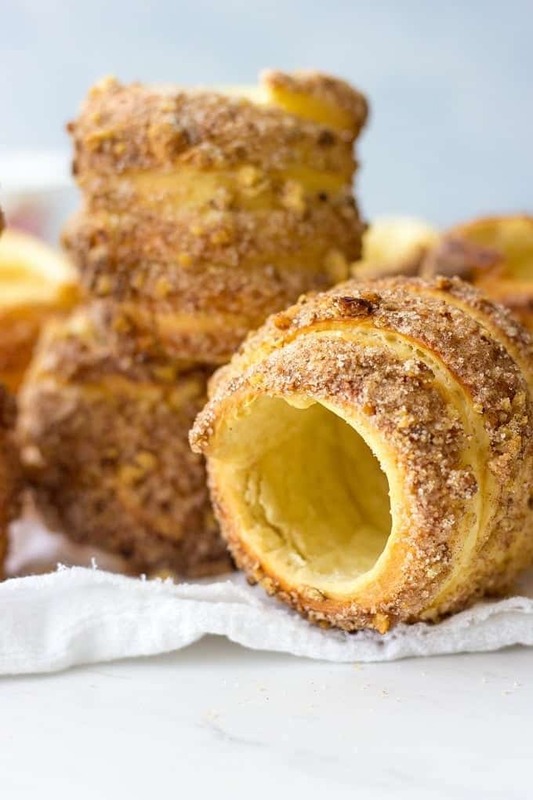 It looks perfect and so convenient for making Trdelnik recipe at home. I found a cheaper alternative to Trdlo stick. It took me for 4 months to discover this solution, but if you’re like me and trying to be frugal where possible, you should totally use my budget version of Trdlo. It totally works. All you need is old magazines. 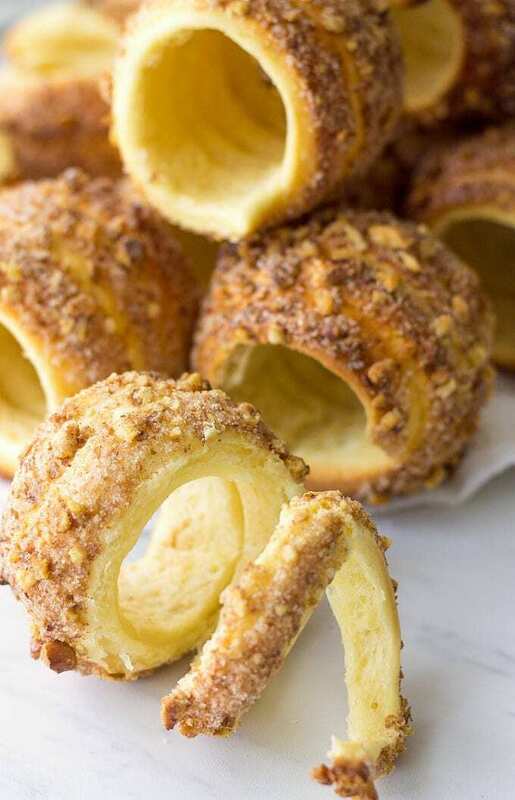 But before I’ll show you a step-by-step detailed recipe how you can make this traditional Czech walnut-cinnamon pastry at home, let me ask you something. Have you ever been to Czech Republic? If not, then you definitely should. It is such a beautiful country, full of history and stunning architecture. In my honest opinion, when people decide where to go on European vacation, Czech Republic is often overlooked. Tell me I’m wrong, but when many of my American friends went to Europe, they chose more popular travel destinations like France, Spain or Italy. I can’t blame them. Those countries are gorgeous. If you’re on a budget but still want to get the most out of your European trip, you should totally visit Czech Republic. You’ll spend less than in Paris or Barcelona, but you’ll receive as much satisfaction and joy from the trip as from other popular European countries. I was lucky enough to visit Prague in my early 20s. Although we endured a long 20 hours bus ride to get there, I was absolutely amazed by the beauty of this small country. Baroque buildings, famous Charle’s Bridge, delicious food… No wonder, Prague has become a popular destination for shooting some well known Hollywood movies. Think Casino Royal, The Illusionist and Mission: Impossible. Now that I’ve told you a bit about beautiful Czech Republic, let’s get down to business. Thanksgiving and Christmas are right around the corner. If you want to try something new, delicious and unusual this holiday season, try making this Trdelnik. 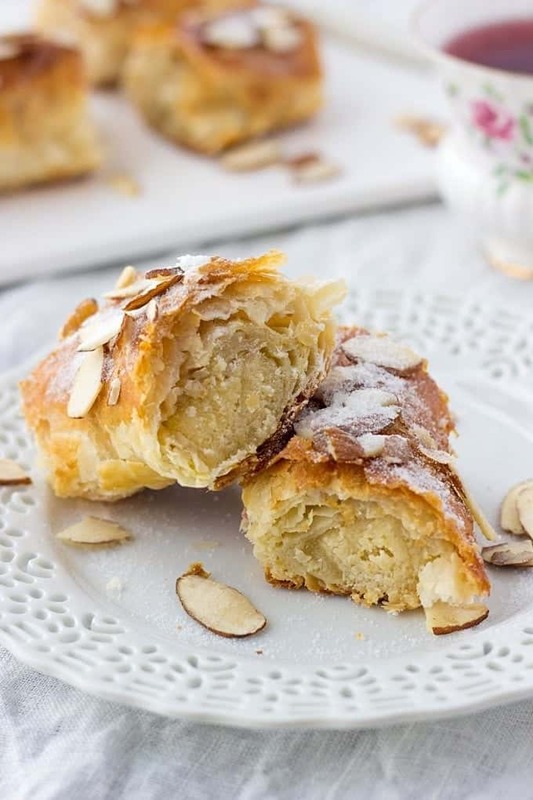 Don’t be intimidated, as I’m going to walk you through the whole process of making this traditional Czech treat. 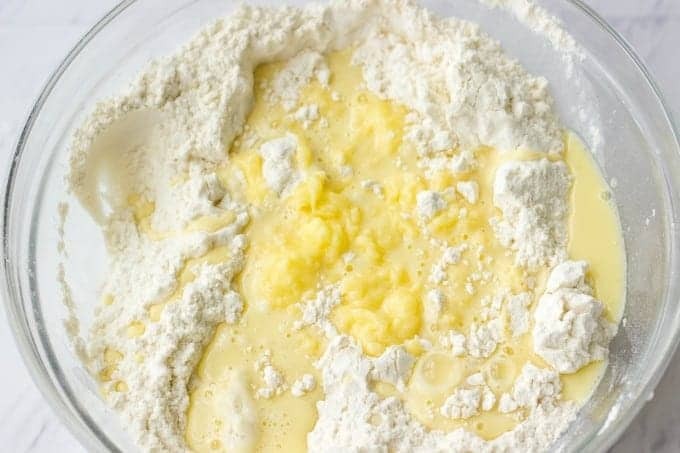 In a large bowl, combine sifted flour, 2 tablespoons sugar, yeast and salt. 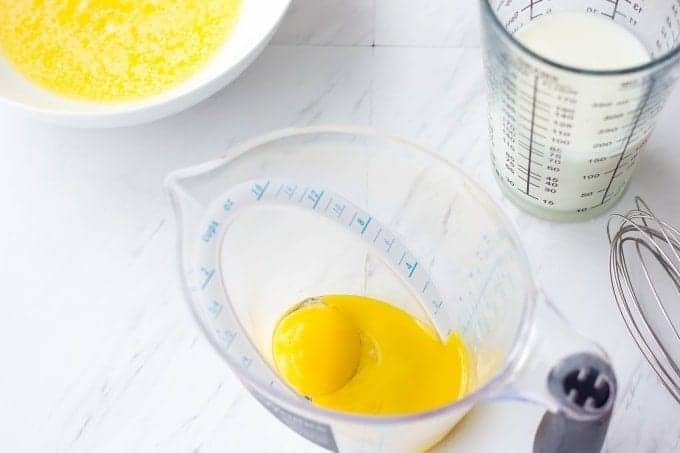 In a medium bowl or large glass, whisk together 2 egg yolks, milk and melted butter. Combine dry and liquid ingredients and mix well. The dough will be quite dense. 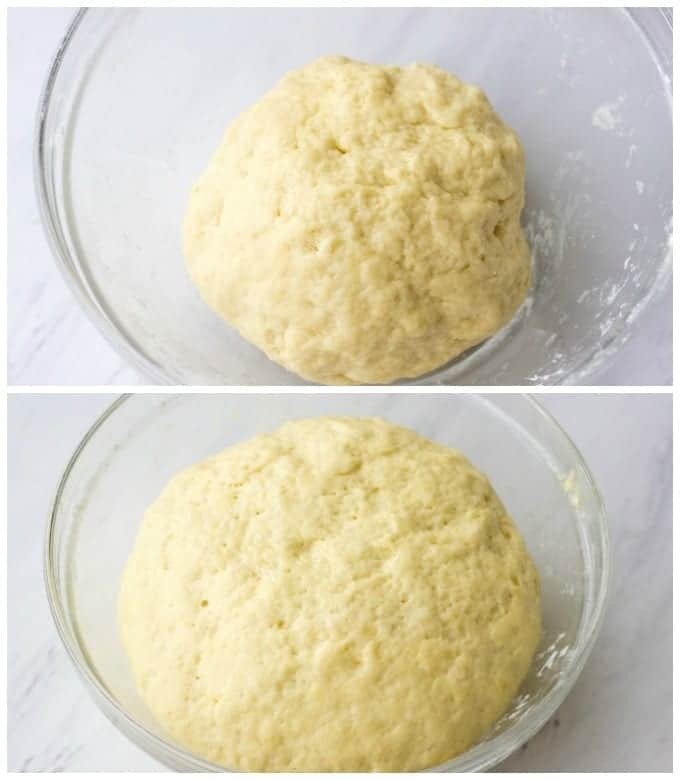 Form the dough into a ball, place it in a bowl, cover and let it rise in a warm place until it almost doubles in volume. Meanwhile, roll old magazines into a stick and secure it with cooking twine. 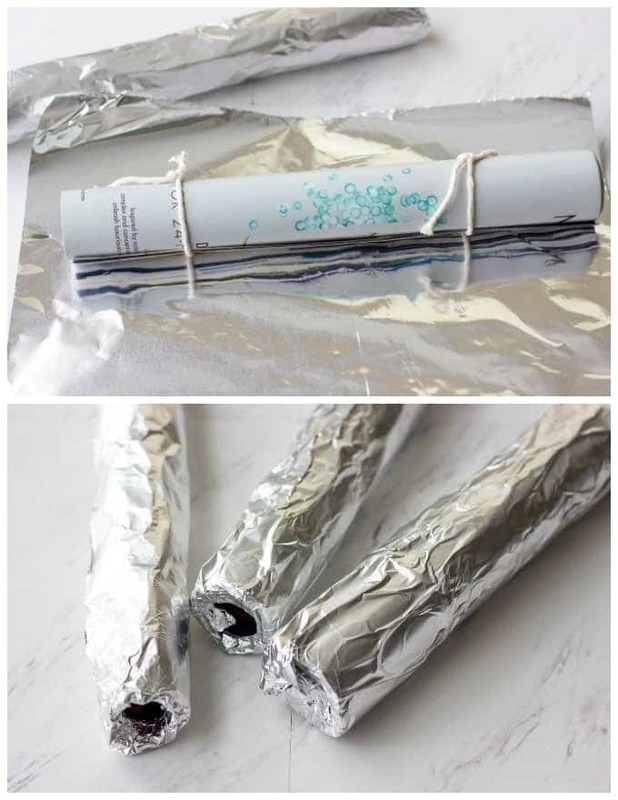 Tightly cover each stick with aluminum foil and tuck edges inside of a magazine. 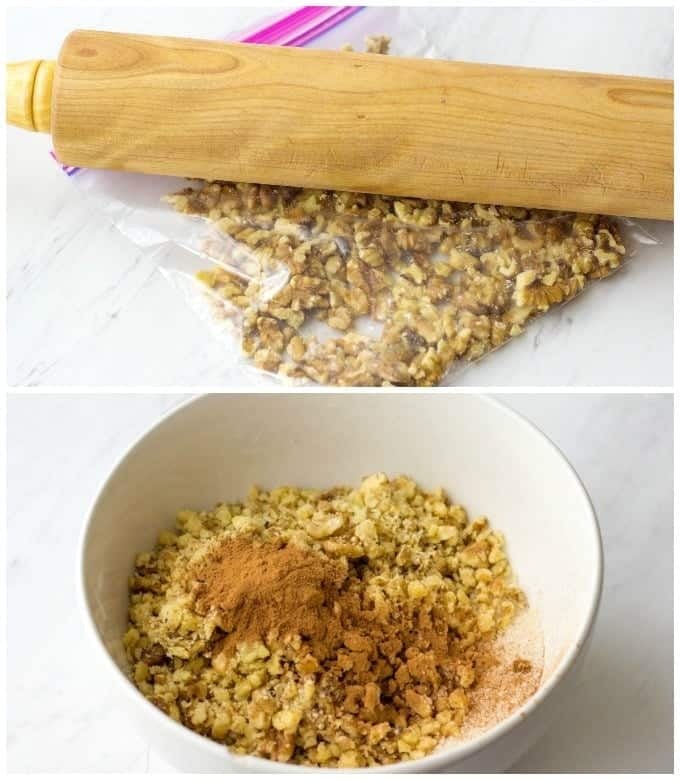 Place walnuts into a tightly closed zip-lock bag and pound it with a rolling pin until walnuts are nicely chopped. Transfer the walnuts into a medium bowl and combine them with sugar and cinnamon. In a small bowl, beat the egg whites until foamy. 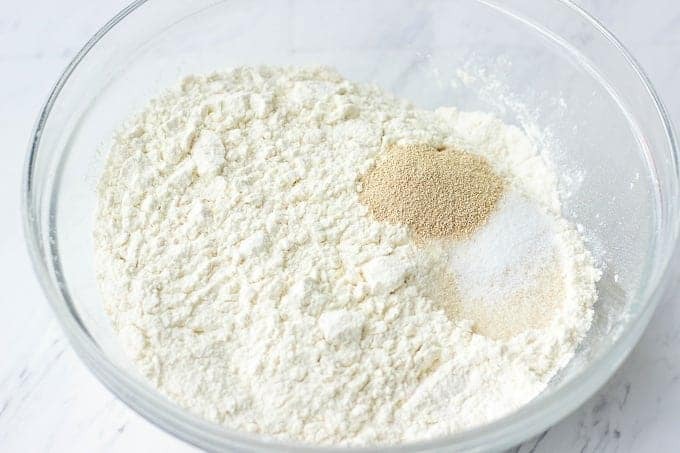 Preheat the oven to 390 F.
When the dough increased in size, on a lightly floured surface roll it into a disk approximately 2-3 millimeters thick. Using a small knife, cut the disk lengthwise into the ribbons of about 10-15 mm wide. Grease each trdlo stick with olive oil. 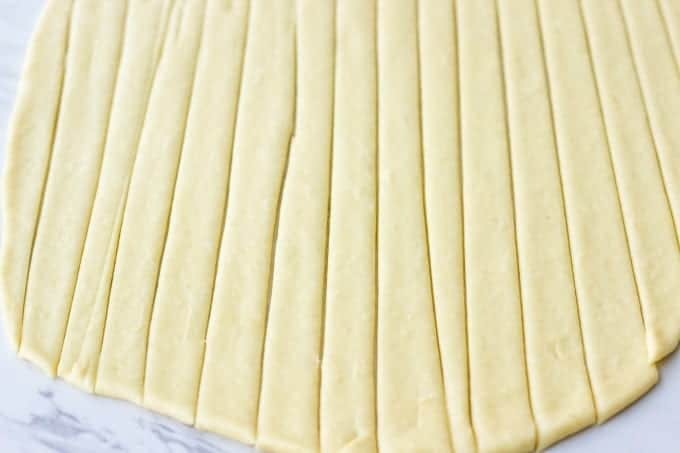 Tightly wrap strips of dough around trdlo sticks making sure each strip slightly overlaps each other. Each trdlo stick should fit up to 3 trdelnik pastries with 1 inch distance between them. 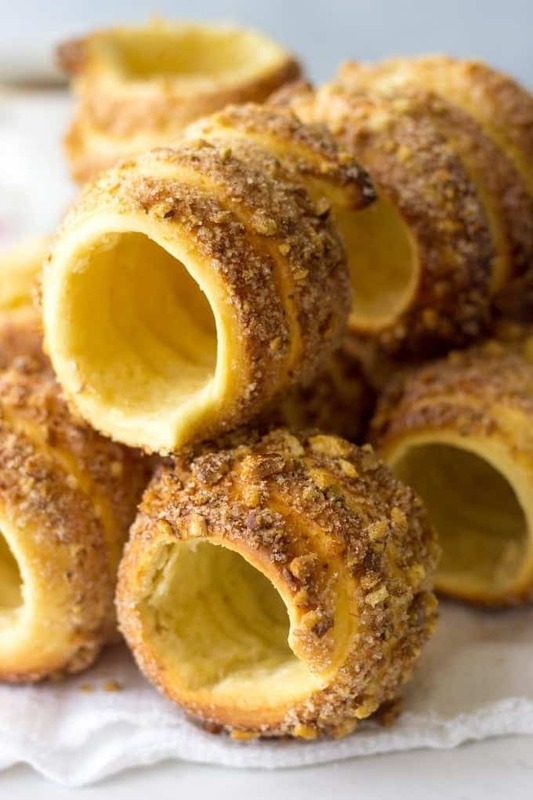 Brush each Czech trdelnik with egg white and generously coat into a walnut and sugar mixture. Place trdlo sticks on a rimmed baking dish making sure pastry doesn’t touch the bottom or sides of a dish. Bake trdelnik for 15-20 minutes until it’s golden on each side. Remove trdelnik from the oven and slowly slide off the trdlo stick and enjoy! Trdelnik is a traditional Czech pastry dough, wrapped around a stick, rolled in cinnamon-walnut and sugar mixture and baked to a crispy perfection. Meanwhile, roll old magazines into a stick and secure it with a cooking twine. Tightly cover each stick with aluminum foil and tuck edges inside of a magazine. In a small bowl, beat the egg whites until foamy. 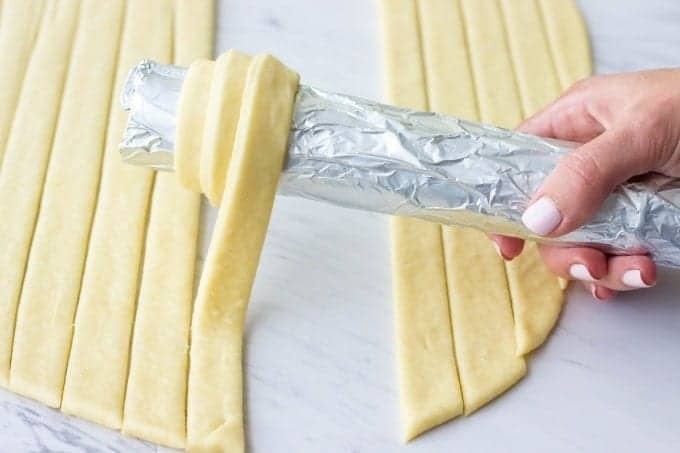 Preheat the oven to 390 F.
When the dough increased in size, on a lightly floured surface roll it into a disk approximately 2-3 millimiters width. Using a small knife, slice the disk lengthwise into 10-15 mm thick strips (thickness doesn't matter much). Brush each trdelnik with egg white and generously coat into a walnut and sugar mixture. Place trdlo sticks on a rimmed baking dish making sure pastry doesn't touch the bottom or sides of a dish. Bake trdelnik for 15-20 minutes until it's golden on each side. 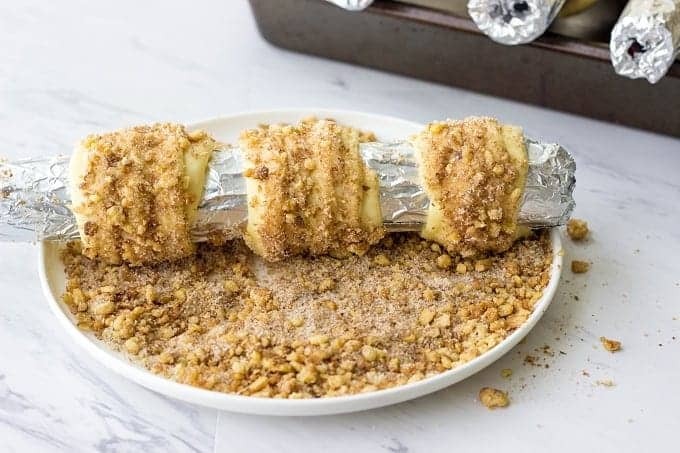 Remove trdelnik from the oven and slowly slide off the trdlo stick. If you make this Prague Trdelnik, don’t forget to snap a photo and post it on Instagram with a hashtag #lavenderandmacarons. You mentioned two different types of flour. Can I just use all-purpose flour for the 480 grams + 5 tablespoons or does it have to be two different types of flour? I am confused as to why there are two different flour measurements. Also, what is the the conversion of 480 grams to cups of flour? Thank you for your help!! Hi Morgan! Sorry for the confusion. Recipe uses only one type of flour – all purpose-flour. 480 grams equals to approximately 3 сups of flour. If the dough is too sticky, you can a few tablespoon more. Another 5 tablespoons are used for sprinkling the working surface with the flour. Hope this helps! Great! Thank you for the quick response. We’re looking forward to trying this recipe this weekend! This recipe looks great Iryna! My family and I were in Prague a few years ago and discovered Trdelnik (fresh off the fire) and fell in love with this delicious treat, and had it many times. I can’t wait to try this recipe. Thanks for posting this! Beautiful! I had a chimney cake in Germany and loved it! Have to try these soon! Thank you Christina! Yea, Chimney Cakes are so popular across many European countries. I’ve actually never tried it while in Europe but was happy to learn about this recipe and make it at home. Hi Dvorah! Thank you! A disc should be 2-3 mm thick. The diameter of the disc would be approximately 45-55 cm. I hope this helps. Thank you. I was confused. Yes, but you’ll need to replace them with something else. If you have flax seeds, combine 2 tablespoons of ground flax seeds and 6 tablespoons of water. Leave it for 10 minutes and use it in a recipe as eggs. Or you can use 1/2 cup of applesauce or 1/2 cup of mashed bananas in place of eggs. Hey Iryna, I went to Prague a couple years ago, and I couldn’t get enough of those! I was going to use a wooden or metal stick over my BBQ, but I am all for trying an oven recipe like yours. My issue is that I am worried about putting magazines in the oven??? Even covered with foil. Aren’t they catching fire? No, they won’t catch fire. I used this method based on the recommendations from several other web-sites. I’ve never heard of any issues. When you tuck the edges of aluminum foil inside the magazines, just make sure, that there’s an opening across the whole stick. That will help with air circulation. Great. Thanks so much Iryna. I will definitely try! It’s so exciting to see something NEW. New to me, anyhow. I can’t wait to try these. Oh my goodness, these look like they would be SO FUN to eat! Any kind of pastry is automatically one of my favorites. But this looks so fun. Pinning. Omg.. this looks awesome and yummy. It’s good to see some unfamiliar treat which is delicious and not hard to tackle. Bookmarked this for future reference. Thanks for sharing. I’d never heard of these until recently; we went to a food festival in the summer and there was a stand that made Trdelnik fresh. We got one and it was amazing!! I couldn’t believe I’d never known about something so delicious! I’m saving your recipe as I’d like to make my own one day! Thanks for your comment Annie! I hope you’ll made Trdelnik one day:) It’s delicious indeed. 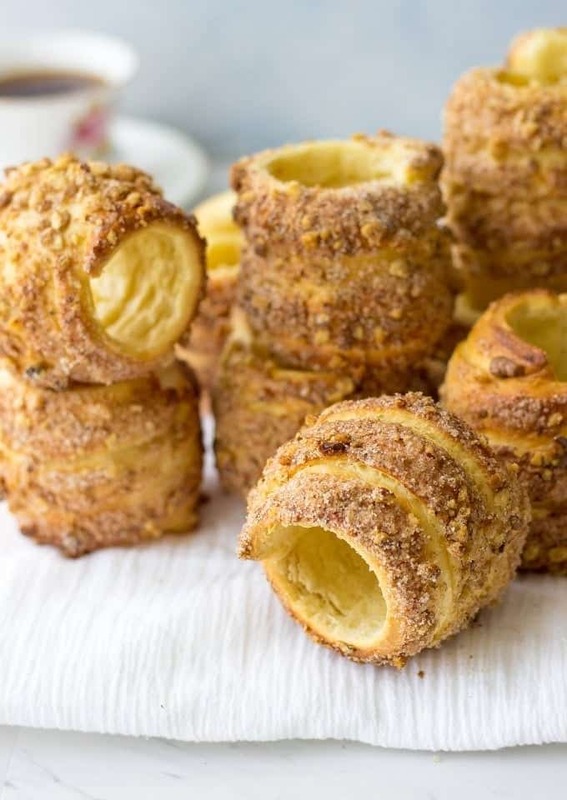 I swear that I’ve seen people wrapping dough on cones on tv baking shows.. but I have no idea where they got them! I like your free solution better. This looks delicious! What a fun recipe. I love your step by step and I’m glad you included it because I was so curious! These cinnamon pastries look soooo good!! I want to try this asap!